Just a week after far-right candidate Jair Bolsonaro’s electoral victory in Brazil’s presidential election, the consequences of fascism and support for apartheid and ethno-nationalism rising to power are already coming to fruition. 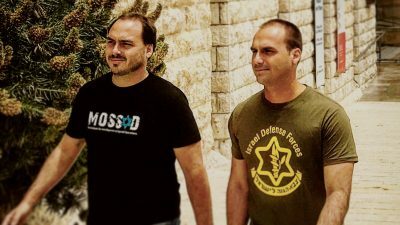 A photo of Bolsonaro’s sons donning shirts depicting logos of Israel’s Mossad spy agency and “Israeli Defense Forces” (military) has gone viral, highlighting how Bolsonaro will normalize ethno-fascism as seen in Apartheid Israel that could stretch from the Americas to the Middle East and beyond. On the left is Carlos Bolsonaro, a member Rio de Janeiro’s Municipal Chamber who affiliates with the right-wing Social Christian Party. It’s no surprise that Carlos would sport a shirt in support of the Mossad; Israel’s vast intelligence agency is used to attack and silence Palestinian activists at home and abroad, and is also believed to be behind several assassinations of Iranian nuclear scientists. In September during the lead-up to the election, Carlos Bolsonaro sparked outrage after sharing a post on Instagram defending the Brazil military dictatorship’s cruelest methods of torture, the so-called “macaw’s perch.” The excruciating technique involved placing a bar over the victim’s biceps and behind the knees which are then bound to the ankles. The macaw’s perch aims to inflict intense musculoskeletal and joint pain as well as psychological torture. He quickly retracted the image while, echoing the words of Trump, claiming the controversy was “fake news” meant to smear his family prior to the presidential election. During the same month, Carlos Bolsonaro took to Instagram once again to post a photo depicting a bloodied man suffocating from torture while bound in a plastic bag. The image was interpreted as a threat toward women and others who stand against right-wing candidates like his father. Carlos Bolsonaro posted this image on his Instagram Story, widely interpreted as a threat toward women and others who stand against right-wing candidates like his father. Alongside Carlos in the tweeted photo is his brother Eduardo Bolsonaro, a member of the Chamber of Deputies and prominent political figure affiliated with the far-right Social Liberal Party that his father Jair Bolsonaro also represents. In the photo, Eduardo dons a t-shirt bearing the insignia of the Israeli military in what can only be interpreted as an endorsement of the violence used against Palestinian civilians. During a speech to Congress in 2017, Eduardo doubled down on previous statements defending the 1964 military dictatorship and their use of torture. Eduardo is fond of using fashion to display his love for torture and right-wing violence. He’s also been spotted wearing a shirt depicting a cartoon photo of Colonel Brilhante Ustra who, prior to his death, stood accused of the death of 60 people and the torture of countless others, including former Brazilian President Dilma Rousseff, during his tenure under the military dictatorship. Their father, President-elect Jair Bolsonaro, boasted on the campaign trail that he would like to strengthen ties with the Israeli regime. In fact, Bolsonaro plans to follow U.S. President Donald Trump’s lead in relocating the Brazilian embassy from Tel Aviv to Jerusalem, a city which Palestinians consider their holy city of al-Quds. Bolsonaro has also announced plans to close the Palestinian embassy in Brazil. Highlighting the growing ties between fascist regimes around the globe, Israeli Prime Minister Benjamin Netanyahu has announced his plans to attend Bolsonaro’s inauguration in January. Netanyahu wasted no time sending congratulatory messages to Bolsonaro following the latter’s election victory. A senior Israeli diplomat, quoted by Haaretz, stated that with Bolsonaro in charge, “Brazil will now be colored in blue and white” — a reference to the colors of Israel’s national flag. This could not be further from what’s already happening in Brazil.